COLORADO SPRINGS, Colo. — After a year of accolades that followed her shooting of a gunman who killed two teenage sisters at her church, security guard Jeanne Assam remains "low key" and says she thinks of the family of gunman Matthew Murray. . . .
Assam said volunteering as an armed security guard at the church remains the highlight of her week. In the year since the shooting, Assam said, she has received an award from a Second Amendment group, as well as other accolades that include a resolution in the state Legislature. She also met President George W. Bush. "I don't feel bad about what I had to do," she said. "I'm sad that people died. ... I wouldn't hesitate to do it again. It still feels a little surreal for me for some reason." Hours later, he drove 65 miles south to New Life Church in Colorado Springs and began shooting as worshippers left a Sunday service. Sisters Rachel Works, 16, and Stephanie Works, 18, were killed. A memorial that includes a stone bench and two blue spruce pine trees will be dedicated on Tuesday, the one-year anniversary. . . . . Wearing a trench coat and carrying an assault rifle [sic], Murray opened fire in the church complex's parking lot and headed into the church. He walked past a playground, which church spokeswoman Amie Streater said was empty that day because it had been snowing, and entered a hallway that led toward the sanctuary past a children's worship area. Well, this bailout surely convinced people that GM won't eventually go bankrupt. A 59 percent interest rate means that people loaning GM money want to get their principle back quickly. Compare this to the interest rates at Bank of America (1.9%), Morgan Stanley (1.5%), JPMorgan Chase (1.6%), or AT&T (6.1%). Opec pledged to cut output by 2.2m barrels a day, on top of cuts totalling 2m b/d agreed earlier this year. But doubts that the cartel’s members would fully comply with the agreement and concerns about the outlook for demand ensured downward pressure on oil prices. . . .
"Concealed carry permit comes in handy for woman in Fort Smith"
Investigators say the would-have-been victim was able to turn the tables because she had a concealed carry permit. State police are keeping some details of the investigation close to their vest so they will know when they get the right guys. Right now, officials are saying they believe this to be an isolated incident. Investigators for the Arkansas State Police are trying to track down the alleged suspects and what's been described as a black Toyota Camry with Oklahoma plates. If you have any information that could be helpful to their investigation, please call Troop H in Fort Smith. Thanks to Karl Christensen for this link. "CNN Meteorologist: Manmade Global Warming Theory 'Arrogant'"
CNN Meteorologist explains the problems with the Global Warming Theory claims. Expert talks about influence of the sun. I wouldn't be surprised if it was someone such as Soros. These types of ads were up frequently before the election. Palin was given a low score and Obama a high one. It is subliminal at the very least, and Obama won't even release his college transcripts. The quiz site is here. If someone can do the leg work about who is behind this, it would be appreciated. The White House will enable Detroit's ailing automakers to survive a little longer by providing low-interest loans, FOX News has confirmed. President Bush will make a statement on the rescue plan at 9 a.m. Friday. Under the plan, General Motors and Chrysler will be able to make it into the new year when President-elect Barack Obama takes the reins of power. According to ABC News, which first reported details of the plan, the loans come with strings attached. The automakers will need to restructure, getting tough concessions from creditors, suppliers, and the labor union. . . . Snow in Malibu and Las Vegas? Malibu is right on the ocean. How is it possible to snow there? That is almost like it snowing on the central Florida coast. It must be global warming -- sorry, I mean now "Climate Change." Is this serious? : "Will the current economic downturn be the worst ever?" AOL.com has this bizarre survey question. The unemployment rate is 6.7 percent and probably about one percentage point of that increase is due to the 50 percent increase in unemployment benefits. The inflation rate is very low, the core inflation rate is about 2 percent. GDP is probably going down right now, but the media has been talking about it declining for a year-and-a-half. Obviously this isn't a scientific survey and obviously this question was drummed up by the people at the Huffington Post, but 65,978 people have participated in the survey and by a slight 45 to 44 percent margin people say that they think that this is "the worst ever" economic downturn. Terms such as "military-style" just seem to be the all purpose term to demonize gun related items, and the media repeats these claims just as they are willing to call so many guns assault weapons. This piece from the LA Times. The measures ban the sale of .50-caliber ammunition, capable of penetrating a car's engine, and would require the city's ammunition vendors to be licensed, to sell ammunition face-to-face instead of over the Internet and require gun dealers to report a full accounting of their inventory twice a year to the Police Department. . . .
BOULDER, Colo. -- Permits to carry concealed handguns in Boulder County have spiked to a five-year high last month. So far in 2008, the Boulder County Sheriff's Office has received 483 applications and issued 428 permits to carry handguns concealed, according to the Boulder Daily Camera. That's up 16 percent from 2007's total, and nearly double the 219 permits issued in 2005. . . . . Mandatory background checks to buy a gun that normally take just minutes now sometimes take up to three hours. For a concealed carry permit, applicants pay a $152.50 fee, of which $100 goes to the local Sheriff's Office and the rest to the FBI and Colorado Bureau of Investigation for federal and state background checks. In Boulder County, 1,916 residents currently hold concealed carry permits, according to the Daily Camera newspaper. Last month, there were 62,000 more background checks of gun purchases than in October 2007, according to the FBI. PLEASE NOTE THAT THE STAR TRIBUNE SEEMS TO BE CHANGING THE PAGES THAT THESE LINKS GO TO. I WILL TRY TO KEEP THEM UPDATED, BUT THERE ARE TOO MANY EXAMPLES HERE FOR ME TO ENSURE THAT THE LINKS REMAIN ACCURATE. 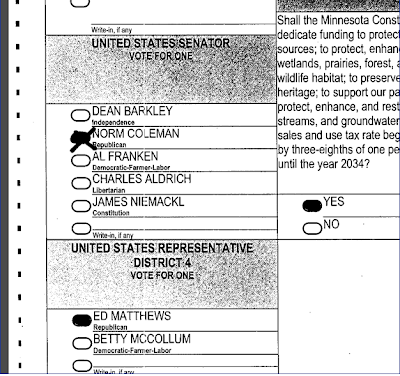 Here is an example where the Minnesota Canvassing Board claims the vote is clearly for no one. Here is another example where the Minnesota Canvassing Board claims the vote is for no one. 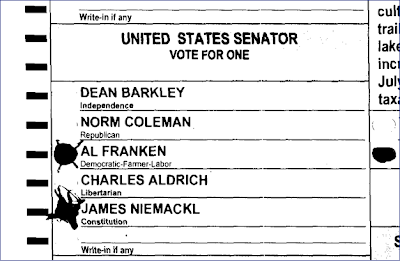 Here is another example where the Minnesota Canvassing Board claims the vote is clearly for Franken. 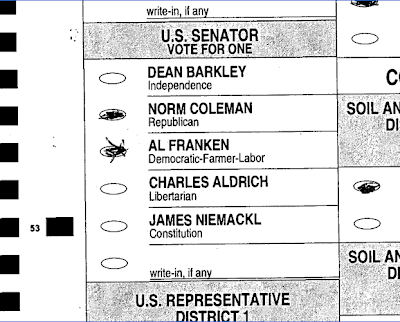 Question: If an "X" through the vote means no when it is for Coleman (see above two examples), why does this "X" mean yes for Franken? Here is another example where the Minnesota Canvassing Board claims the vote is for no one. 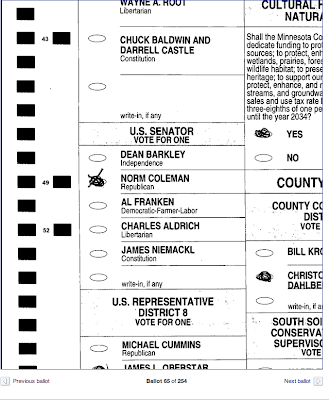 Apparently, an "X" when it comes to a Coleman ballot doesn't mean no in some cases. Here is another example where the Minnesota Canvassing Board claims the vote is for no one. 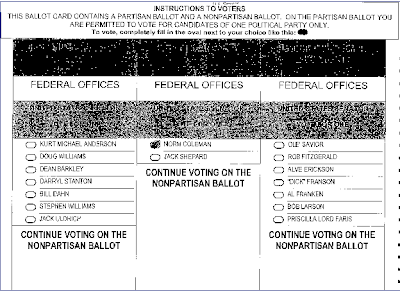 This vote is disqualified because the voter used the wrong ballot, but there are a couple things to note. 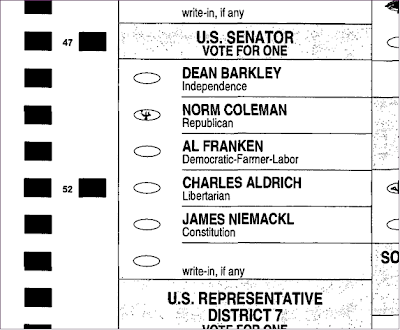 I haven't found any similar cases for Franken, and it would be useful to have some discussion of how the voter got the wrong ballot. Here is another example where the Minnesota Canvassing Board claims the vote is for no one. Same as previous case. On the other hand, there are some calls that could arguably go either way that they made in Coleman's direction. 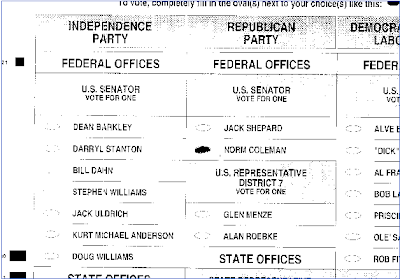 Here is another example where the Minnesota Canvassing Board claims the vote is for Coleman. Another example is here, where the decision was made in favor of Coleman. 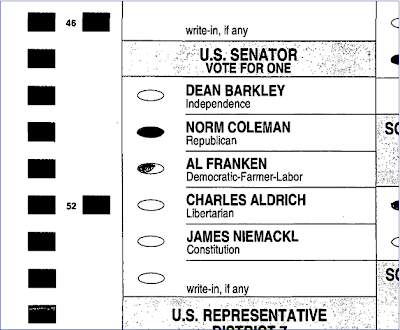 Still overall I think that there are many more questionable decisions that go in Franken's favor than the reverse. After consulting with the Democrat Attorney General, at first Ritchie rejects Franken’s desire to count rejected Absentee Ballots relying on the Attorney General’s opinion that such ballots are not a subject of a recount but rather for the courts to decide in an election contest. The Attorney General’s office opinion is here. UPDATE: A couple of the examples that I originally had here were removed. They involved whether voters had made an identifying mark on their ballots. These are not always obvious to me (e.g., is the note "TO" an identifying mark?). In any case, the point distracted from the other real questions here. During the recount an Election Official explained an error that resulted in Franken losing votes occurred when a precinct double counted some votes on election night. But after pressure from Democrats made the official change her story, the Mark Ritchie led Canvassing Board decided for that precinct only the recount did not count and would instead use the more favorable to Franken Election Day total. . . . . During the presidential campaign, Sarah Palin was criticized for having too thin a résumé to be vice president. But one portion of her record stands out now as being particularly relevant in the wake of Illinois Democratic Gov. Rod Blagojevich's arrest last week and Barack Obama's long-standing silence of Chicago ethics. In 2003, Ms. Palin was appointed chairwoman and ethics supervisor of the Alaska Oil and Gas Conservation Commission by then-Gov. Frank Murkowski. Before long she spotted what appeared to be ethical violations by fellow Republicans and also found the governor's response to be so sluggish that it bordered on willful blindness. The two Republicans she pointed fingers at were Randy Ruedrich, the state GOP chairman and a fellow oil and gas commissioner, and Gregg Renkes, the state's attorney general. Her beef with Mr. Ruedrich was that he appeared to be too close to a company he was supposed to be regulating. And Mr. Renkes appeared to have a financial conflict of interest in negotiating a coal-exporting trade agreement. Mrs. Palin blew the whistle internally on both men. When nothing happened, she quit less than two years into her term. Later, when she was criticized by some Republicans for unfairly pointing an accusatory finger, she penned an op-ed and, using her famous hockey-mom metaphor, underlined the importance of holding government officials -- even members of her own party -- to high ethical standards. The incident cemented her reputation as a reformer when both men were later forced to resign and Mr. Ruedrich paid a $12,000 fine. Mrs. Palin went on to unseat Mr. Murkowski in a hard-fought GOP primary in 2006. Compare this record to Mr. Obama's. An ethical cloud has been hanging over Mr. Blagojevich for years. We now know federal officials began looking into his affairs within months after he was elected in 2002. Mr. Obama came up in Chicago politics, shared at least one fundraiser with Mr. Blagojevich -- Tony Rezko, who was recently convicted of fraud and bribery -- and several other acquaintances, including top labor officials. But he apparently never saw any reason to publicly question the governor's ethics. In the past week the Obama camp has been compiling a list of contacts with Mr. Blagojevich and his inner circle since Election Day, which it will supposedly release next week. When that list comes out, let's hope it accurately portrays the overlap between the Obama and Blagojevich circles in Chicago. The question that will remain, however, is why didn't Mr. Obama ever assume the type of leadership role Mrs. Palin did in moving against public corruption within his own party and state? Bernard Madoff, who appears to be the perpetrator of the largest financial fraud ever, was a politically active player in Washington. He paid the lobbying firm of Dow Lohnes Government Strategies some $400,000 over the last decade to buttonhole regulators and Congressmen. The Madoff clan were also large donors to political candidates. They donated over $380,000 to individual politicians and political action committees since 1993, most of it going to Democrats but with a few prominent Republicans thrown in, such as scandal-tarred Rep. Vito Fossella of Staten Island. As late as September of this year, Mr. Madoff was still giving generously to his favorite political cause: the Democratic Senatorial Campaign Committee headed by New York Sen. Chuck Schumer. Mr. Madoff contributed $25,000 in September, bringing his total donations to the DSCC to $100,000 over the last three years. Mr. Schumer, who has assiduously cultivated Wall Street for years, also benefited individually from Mr. Madoff's largesse -- taking in $39,000 from the Madoff family for his 1998 and 2004 Senate races. "The great irony here, from a political perspective, is that Republican lack of oversight allowed a lot of well-connected Democrats -- like Madoff -- to run wild," says Joel Kotkin, an urban affairs analyst who is a fellow at the liberal New America Foundation. "Now Obama will have to deal with a series of scandals and meltdowns that have taken place within a financial community -- particularly hedge funds which may be the next locus of the financial crisis -- that have been tilting what is now considered 'left.' It was so much simpler in the old days when the GOP could be easily identified as the party of 'big greed' while most Democrats concentrated on 'little greed,' like government payoffs and sweetheart contracts." Mr. Kotkin told Politico.com that Democrats should worry about increased scrutiny of hedge funds, especially those run by traders such as George Soros: "They are more big-time backers of the Democrats, and may be exposed in the next turning of this potboiler reality we are now experiencing. It could get a bit scary." President-elect Barack Obama's incoming chief of staff, Rahm Emanuel, was pushing for Obama's successor just days after the Nov. 4 election, sources told the Chicago Sun-Times. Emanuel privately urged Gov. Blagojevich's administration to appoint Obama confidante Valerie Jarrett, and the Sun-Times learned Tuesday that he also pressed that it be done by a certain deadline. Jarrett was initially interested in the U.S. Senate post before Obama tapped her to be a White House senior adviser, sources say. The disclosure comes days after Obama's camp downplayed Jarrett's interest in the post. . . . .
Holder, however, omitted that event from his 47-page response to a Senate Judiciary Committee questionnaire made public this week -- an oversight he plans to correct after a Chicago Sun-Times inquiry, Obama's transition team indicated late Tuesday. . . . .
"Scientists Call AP Report on Global Warming 'Hysteria'"
"If the issues weren't so serious and the ramifications so profound, I would have to laugh at it," said David Deming, a geology professor at the University of Oklahoma who has been critical of media reporting on the climate change issue. In the article, Obama Left with Little Time to Curb Global Warming, AP Science Writer Seth Borenstein wrote that global warming is "a ticking time bomb that President-elect Barack Obama can't avoid," and that "global warming is accelerating." Deming, in an interview, took issue with Borenstein's characterization of a problem he says doesn't exist. "He says global warming is accelerating. Not only is it continuing, it's accelerating, and whether it's continuing that was completely beyond the evidence," Deming told FOXNews.com. "The mean global temperature, at least as measured by satellite, is now the same as it was in the year 1980. In the last couple of years sea level has stopped rising. Hurricane and cyclone activity in the northern hemisphere is at a 24-year low and sea ice globally is also the same as it was in 1980." Deming said the article is further evidence of the media's decision to talk about global warming as fact, despite what he says is a lack of evidence. . . .
A very amusing review of the new movie "Che"
MEET Che Guevara. Just think of him as Jesus plus Abraham Lincoln with a touch of Moses and Dr. Doug Ross. After 4½ hours of watching Dr. Ernesto "Che" Guevara heal the sick, teach the illiterate, daze the women, execute the lawless, defeat the corrupt, uplift the peasantry and spew the sound bite, I was convinced there would be a scene in which he turned water to Bacardi. You can't spell cliché without "Che." And as I endured this mad dream directed - or perhaps committed - by Steven Soderbergh, I wondered where I'd seen it all before. The booted stomping through the greensward, the jungly target shooting? It's a remake of Woody Allen's "Bananas," right? Minus punch lines - or perhaps with them. "We are in a difficult situation," Che observes, at a point when his army is surrounded and forced to eat its horses. The story of the Argentine doctor Ernesto "Che" Guevara is played with much broody self-importance by Benicio Del Toro. It will be shown in two parts after its one-week opening run. That way, on consecutive evenings, it can bore everyone but activist grad students. . . . In an earlier post, I linked to the controversy over the photo that Newsweek ran for Gov. Palin. Some who wrote in claimed that the major weeklys no longer doctored or even corrected photos (despite the obvious comparisons to Obama's retouched photos). In any case, here is a recent story on Time magazine doctoring Steven Jobs' photo to make him look thinner and presumably making him look ill.
* An "iTunes tax" of 4 percent on videos, music or pictures downloaded from the Internet. * A 4 percent tax on taxi, limo and bus rides. That means a $10 cab ride would cost 40 cents more. * A 4 percent entertainment tax on tickets to movies, concerts and sporting events. That would add nearly 50 cents to a $12 movie ticket or $1.80 to the cheapest $44.50 seat at a Knicks game. * The tax on beer increases 24 cents per gallon, or more than double the current rate, which means about 30 cents a case. * An 18 percent tax on nondiet soft drinks, which aims to reduce child obesity. A $1.50 can of Pepsi would then cost at least 25 cents more. * A 4 percent tax on cable TV and satellite services, raising a $100 bill by $4. * Hiking the cost of "personal" services - including haircuts, manicures, pedicures, massages and gym memberships - by 4 percent. * A 4 percent sales tax on clothing and shoes under $500, except for two weeks out of the year. * Elimination of the law that caps the state sales tax on gasoline at 8 cents per gallon. * Boosting the average vehicle registration fee for drivers by $11, from $44 to $55. Fees for new or renewed licenses also would increase 25 percent, or increase from $50 to about $62 to renew a license over eight years. . . .
During the Second Presidential debate, Obama said: "I think everybody knows now we are in the worst financial crisis since the Great Depression." in the first presidential debate, Obama said: "we are going through the worst financial crisis since the Great Depression." In the third debate: Obama said: "I think everybody understands at this point that we are experiencing the worst financial crisis since the Great Depression." ST. PAUL, Minn. (AP) The Minnesota Supreme Court is getting involved in the state's unsettled U.S. Senate race. The court said Monday it will weigh whether to stop the sorting and counting of wrongly rejected absentee ballots until clear instructions are handed down. Republican Sen. Norm Coleman petitioned the court to step in after the state board overseeing the recount recommended those ballots be considered last week. Coleman maintains there aren't clear guidelines for the recommendation and could lead to disarray among the 87 counties. Democrat Al Franken made a big push to include absentee ballots in the recount that were improperly set aside. 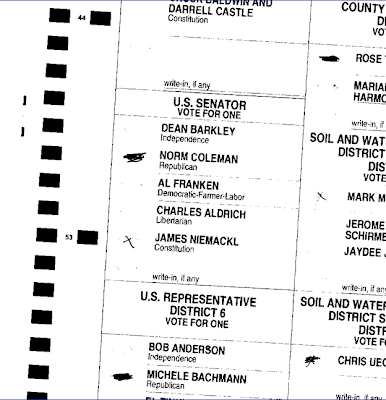 Minnesota has four legal reasons for rejecting an absentee ballot, but some of the decisions on or before Election Day fell outside those reasons. The Supreme Court asked the parties to submit arguments in writing by Tuesday in advance of a hearing the next day. Another Democrat Pay for Play Scandal? Dec. 15 (Bloomberg) -- A federal grand jury is investigating how a company that advised Jefferson County, Alabama, on bond deals that threaten to cause the biggest municipal bankruptcy in U.S. history, did similar work in New Mexico after making contributions to Governor Bill Richardson’s political action committees. The grand jury in Albuquerque is looking into Beverly Hills, California-based CDR Financial Products Inc., which received almost $1.5 million in fees from the New Mexico Finance Authority in 2004 after donating $100,000 to Richardson’s efforts to register Hispanic and American Indian voters and pay for expenses at the Democratic National Convention in 2004, people familiar with the matter said. . . .
Barack Obama has garnered praise from center to right -- and has highly irritated the left -- with the centrism of his major appointments. Because Obama's own beliefs remain largely opaque, his appointments have led to the conclusion that he intends to govern from the center. Obama the centrist? I'm not so sure. . . . .
General Motors’ bonds are currently yielding a whopping 56 percent. But, with the interest rate on U.S. government bonds paying close to 0%, are people rushing out to buy these General Motors’ bonds? Do people really think that this is a great way to make a killing? Hardly. General Motors’ high interest rate means one thing: investors who have their money on the line don’t believe that these bonds will get paid off. In fact, this interest rate is so high that investors don’t even believe that General Motors will make it to Christmas two years from now without declaring bankruptcy -- a bankruptcy where bondholders would get little or nothing back. The extraordinarily high interest rate shows that a bailout obviously won’t fixed the problem. . . . But editors decided to publish the story on Friday, Dec. 5, ending the Tribune’s own cooperation deal with the prosecutor. . . .
Today, Monday, December 15, marks America’s Bill of Rights Day, the anniversary of the ratification of the Bill of Rights of the U.S. Constitution. Put it next to Flag day and various presidents' birthdays. I have been making a similar bottom line (even if emphasizing different points) in my op-eds. James P. Moore, Jr. has this piece in Sunday's Washington Post. One other point that I would like to make. I pointed to the high interest rate on GM bonds, but there are also plenty of entities that have very low interest rates on their bonds. If "no one was lending money" as we frequently hear claimed, you would imagine that interest rates would be much higher. 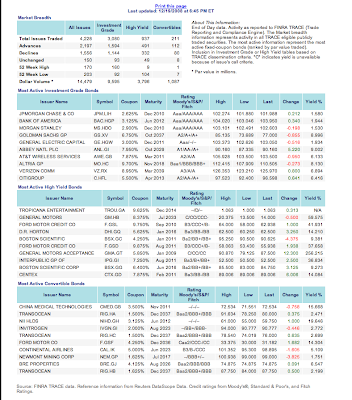 Bank of America's bonds are yielding 2.3 percent, Morgan Stanley is at 2.2 percent, and Wachovia is at 6.5 percent. Personally, it would have made a lot more sense to completely scrape these accounting regulations. The "does not exist" phrase is too restrictive, as few markets are completely absent. This from the Washington Post. The Securities and Exchange Commission and the Financial Accounting Standards Board have just made an announcement that, dry as it sounds, may mean a great deal: "When an active market for a security does not exist, the use of management estimates that incorporate current market participant expectations of future cash flows, and include appropriate risk premiums, is acceptable." . . . Simply put, mark-to-market accounting requires companies to set the value for the assets they own at the price they could fetch on the open market right now. The prices must be "marked to market;" hence the phrase. What does that have to do with the current crisis? The root problem now is that financial institutions have been caught holding value-less, or "toxic," assets on their books, such as the mortgage-backed securities based on sub-prime mortgages that have defaulted. The government believes that those assets will be worth something soon -- that's why they want to buy them in the $700 billion Wall Street rescue plan. But under mark-to-market rules currently required, they are worth almost nothing, threatening those who hold them with insolvency. . . .
Should healthy adults be able to take so-called "smart" pills? I have posted frequently on this in the past, so I thought that I would point out this debate covered in The Chronicle of Higher Education. A year after a commentary in the journal Nature ignited a debate about the use among academics of drugs to enhance their mental energy and ability to work long hours, a group of scientists and ethicists write in the same journal that they believe, in theory, that healthy people should have the right to use “smart” pills. The authors of the new essay, according to the Associated Press, pose a number of caveats on that statement, including calling for more research about the unknown risks of using the drugs, which are commonly prescribed for sleep disorders or hyperactivity. But the authors assert that “we should welcome new methods of improving our brain function,” and that doing it with pills is no more morally objectionable than eating right or getting a good night’s sleep. One of the seven authors, Martha J. Farah, who is director of the Center for Cognitive Neuroscience at the University of Pennsylvania, noted that surveys and informal polls have shown that some professors and students acknowledge using such drugs illegally to help them study or remain alert for long hours. “It’s a felony, but it’s being done,” Ms. Farah told the news service. As more effective brain-boosting pills are developed, she said, demand for them is likely to grow. While some health experts agreed that the issue deserves attention, Leigh Turner, associate director of the Center for Bioethics at the University of Minnesota, took issue with the essay: “It’s a nice puff piece for selling medications for people who don’t have an illness of any kind,” he told the Associated Press. The essay, “Towards Responsible Use of Cognitive-Enhancing Drugs by the Healthy,” is available online to Nature subscribers or for purchase. The Giants are still 11-3, but they have lost two straight games since receiver Plaxico Burress was suspended for violating NYC's draconian concealed handgun regulations. Miami Dolphins linebacker Joey Porter had plenty to say when asked about New York Giants receiver Plaxico Burress' latest troubles, and Porter can speak from experience. Porter, in an interview that will be aired Wednesday morning on "ESPN First Take" (10 a.m. ET, ESPN2), said some NFL players feel the need to have a firearm to defend themselves and their families, and that Burress, while caught in not "the smartest situation," has been unfairly portrayed in the media. "Plaxico is like a brother to me. I take it real personal how he's being treated," Porter said. "Everybody has their mistakes, but that's exactly what they are ... Until you've been in that situation, when you've been robbed at gunpoint or you've had a gun waved in your face or had your house broken into before or been carjacked, you really don't know what it's like." . . .
"For a person to carry a gun, I mean, you're not carrying a gun to show that 'I'm tough.' It's safety, it's nothing but safety," Porter said. Porter had his own scare on Aug. 30, 2003, when he was with the Pittsburgh Steelers. He decided to fly out to see Colorado State, his alma mater, face Colorado. Afterward, he went to a Denver bar with some friends and, while standing in a parking lot with about 150 other people, got caught in the middle of a shooting. Denver police said Porter was an innocent bystander, and that the shooting, which left one dead and five others wounded, was possibly gang-related. . . . The NFL Players Association filed a grievance on Tuesday challenging the suspension and fine given to Plaxico Burress by the New York Giants after the receiver accidentally shot himself in a nightclub more than a week ago. . . .
SF Chronicle: "Minorities, women, gays lobby for Obama jobs"
As the United States awaits the inauguration of its first nonwhite president, organizations representing women, gays and lesbians and people of color are working overtime to encourage President-elect Barack Obama to make good on his remark that he would nominate "one of the most diverse Cabinets and White House staffs of all time." . . . This year, the zeal to work in the administration of the nation's first African American president has been overwhelming. The Obama transition Web site, www.change.gov, has so far received 331,000 job applications for about 3,000 positions, said Martha Joynt Kumar, a Maryland political scientist who is director of the White House Transition Project, a nonpartisan group that assists presidential transition teams. That's almost triple the number received by President Bill Clinton and almost eight times the applications to serve in the government of President Bush. . . .
Wow, a lot more Democrats sure want to work in Washington than Republicans. In addition, I might add that Bush ended up appointing some Democrats below the cabinet level to work in his administration. The Philadelphia Inquirer has this story. Hopefully the woman's actions are helping educate people. Before heading out the door to go to Wal-Mart, Meleanie Hain fussed over her children, grabbed her coat and keys, then ran upstairs to get one more item: her loaded Glock 26, which she strapped to her hip. Hain, 30, has caused a stir in this rural Pennsylvania Dutch community 25 miles east of Harrisburg for packing a gun everywhere she goes, including to her 5-year-old daughter's soccer games this fall. She's paid a big price for sticking to her gun. The mother of four, who often carries a baby on one hip and her Glock on the other, has been criticized by even the most ardent gun-lovers. From once-friendly neighbors to the local police chief, the general feeling is that Hain's pistol-packing behavior is, well, extreme. "People get alarmed because they don't see that too often," said Charlie Jones, a soccer coach who confronted Hain about the gun at a Sept. 11 game. "They don't know what your intentions are going to be." Hain said the outcry has hurt her babysitting business and left her feeling isolated. She has been called an attention-seeker, psycho, moron and worse on hundreds of pages on Internet forums. Neighbors have blasted her on radio shows, her daughter's principal warned her against taking the gun to school (she doesn't), and the local police chief advised her to put it away. Now she is firing back. On Oct. 24, Hain filed a federal lawsuit against Lebanon County and Mike DeLeo, the sheriff who revoked her gun permit after jittery parents complained about her at the Sept. 11 game. The suit says they violated her constitutional and civil rights and seeks more than $1 million. . . .
Stephen Halbrook has a new book entitled The Founders' Second Amendment. Buchanan's piece can be found here. Yet Barack stayed cool. Not for 24 hours did he join the clamor for Gov. Rod Blagojevich to stand down. . . .
Who told [Blagojevich] Barack would not pony up and play ball? And if any Obama aide was solicited for a bribe, did they relate that to Obama? Did they report it to the FBI or the U.S. attorney's office? . . . This one is not going away soon. . . .
Companies leaving the US -- "investment fleeing the country"
Energy: Another day, another oil company fleeing the country. No, this isn't Ecuador, the banana republic that just defaulted on its debt after chasing out investors. It's the United States, and what we're seeing is self-defense. Much political hay has been made in Congress about "unpatriotic" corporations that move operations abroad. Weatherford International is the latest, taking its headquarters from Houston to Switzerland. The oil services company said that it wants to be closer to its markets. But what it really meant was that it no longer saw the future in the U.S. In a political atmosphere of blaming corporations, it's no wonder. Halliburton fled to Dubai in 2007. Tyco International, Foster Wheeler and Transocean International all went to Switzerland. As a pattern emerges, America's global standing diminishes, in part because it's based on the willingness of companies to invest. It's an especially bad sign when domestic companies flee. . . . Huge companies such as Exxon Mobil, whose market cap exceeds the GDP of most countries, create $100 billion in earnings in quarters when oil prices soar. It looks high, but over the years, the industry's average returns, at 9%, are less than other industries. Nevertheless, Exxon's profits are evidence of its success at extracting oil from miles below the earth's surface, even underwater, and from unbelievably hostile environments, such as the Arctic. Instead of being objects of national pride for their productivity and efficiency, and subjects of heroic Hollywood movies, their success is considered to be dishonest. Congressional hostility affects oil companies' operations abroad, too: Exxon, remember, noted that Congress' animus toward oil profits directly encouraged Hugo Chavez's uncompensated expropriations of $1 billion of Exxon's assets in Venezuela, which drove oil prices higher. . . . .
You can find an interesting discussion here on whether Obama did in fact meet with embattled Illinois Governor Blagojevich immediately after the November election. Should we allow Performance Enhancing Drugs in Competitive Sports? A debate sponsored by Intelligence Squared is provided here. I did appreciate one quote from Vince Lombardi: "If you are not fired with enthusiasm, you will be fired with enthusiasm." For an earlier discussion by myself on this question please see this. In the first 10 months of this year, 43,095 such permits were issued. . . . The Government has also made it easier for men who have previously been the subject of apprehended violence orders to regain a gun licence. . . .